Great question. I was fortunate enough to take my work bench on the road to build a bench for a friend which went to sofa and sold successfully for at least four figures. Loved her art and glad it sold! Feel good about the bench as it had to support at least three hundred pounds without deflection to crack any of her tiles. Fun project and success always makes the labor part forgettable. Picture of it going to its new owner attached. 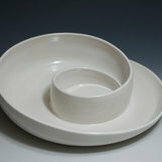 Complete a couple glaze formulations to work well over heavy underglaze on low expansion porcelain. 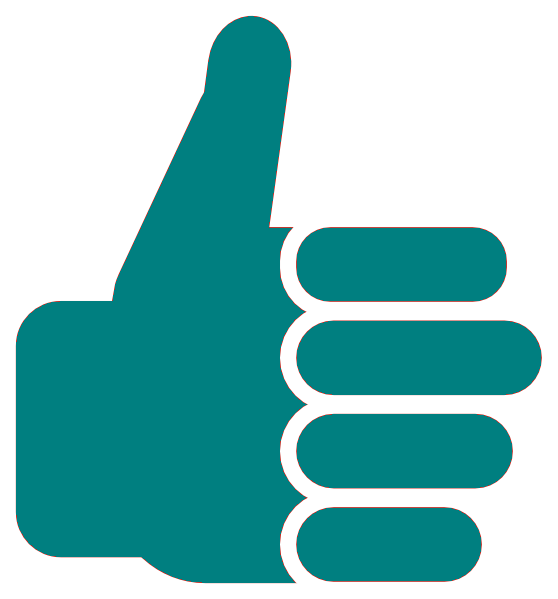 Test are going well and should be able to publish after the first of the year. Additional December project was to get at least four basic throwing videos done for newbies in the studio. Three done so far so we will just keep plugging along. 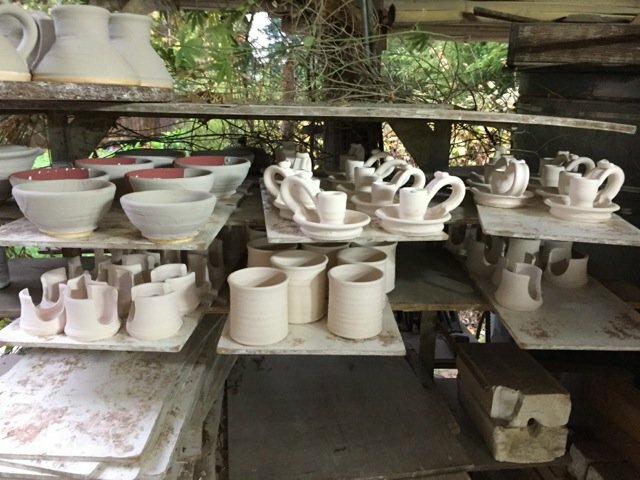 last project was to begin creating a glaze workshop for the resident artist at the studio. Just beginning this one and have outlined it. Thus far I like the direction and content. Glazing for this weekend firing. Opps. Well, if you must know, I was filling a humidifier container from my utility sink, forgot to close the top off, tripped over my own feet, and--to keep myself from tipping over--quickly set the thing down on the clear edge of the glazing table so I could free my hand to catch my balance, where the unit wobbled over and crashed into the greenware, and then spilled water just to add insult to injury. That is the sad story. Oh well, no handmade Christmas candy dish for Aunt Ruthie. but it did bring a wry smile to my face and memories of tools falling off a 20’ ladder near some formerly really nice finished wares. This sounds like a comedy sketch. 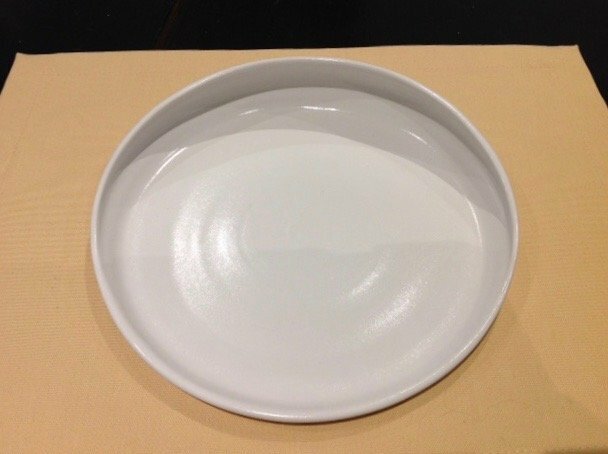 Prototype dinner plate for a disabled family member, she has partial use of one hand, paralyzed on the other side. Theory is she will be able to push her fork to the curved in back edge of the plate to keep the food on the fork. Front edge of plate is smooth and rounded over so she can rest her wrist either on that or the table. Denice, do you by any chance have a photo of one of yours? 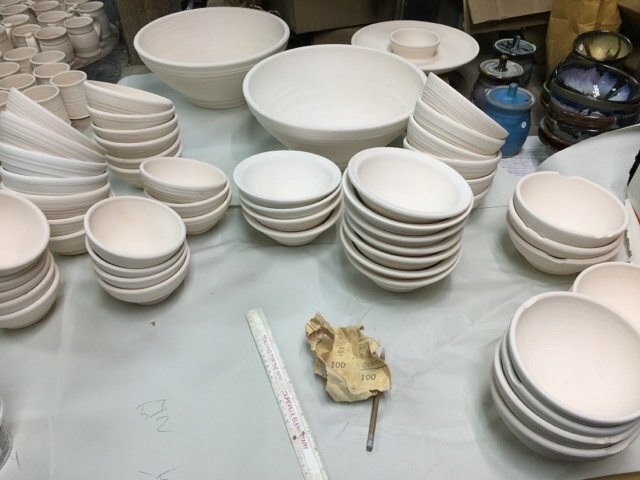 If I can get the design to work I want to try a couple sizes of bowls too. I was thinking of the old Beatrix Potter porridge bowls but taller with the front partially cutaway. Did you make bowls also? I has a customer request this same item-but I do not do special orders anymore. Sorry to hear that. Doesn't it always seem, that a Rube Goldberg series of events, leads to such things? For me, I know it's the case, because I don't clear the clutter as much as I should. So if one thing gets hit, or shoved, several other things are going with it. Seems like the seals were working just fine! Five snowflakes, destined to become mobiles like this one. 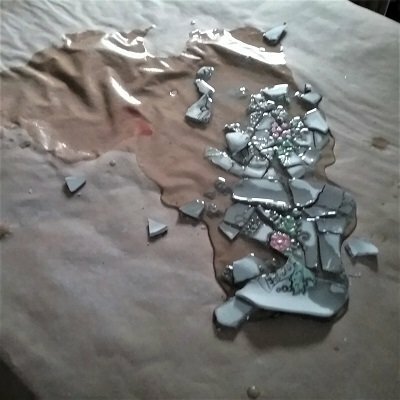 Broke a piece off every single one of them between workbench and kiln. Let's see what the kiln gods can do with them. Love this dish idea. Wow! 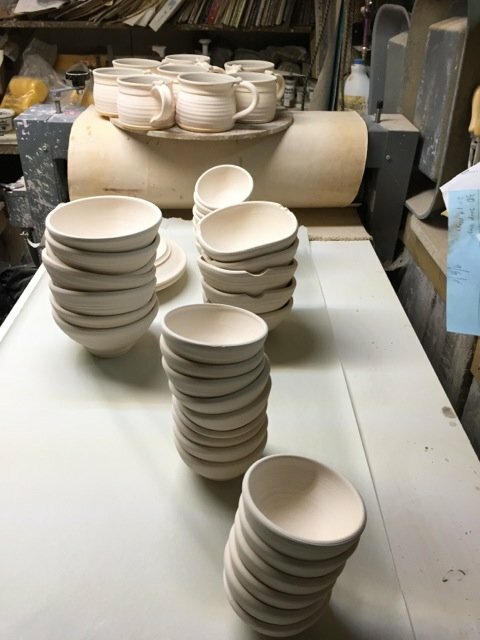 I was an occupational therapist; now a beginner potter - and I think making this kind of bowl is a goal for me. I am going to go down to our children's center for kids with disabilities and see what shapes they recommend and see if I can (eventually) reproduce the shape. Thanks. Welllllllllp, I ended up having time to go get clay over the weekend. Picked up 500lbs, as well as some glaze chemicals I wanted. I threw a big 15lb moon jar out of recycled clay last night, wow what an experience! It was probably a little softer than I should have thrown with but it was a lot of fun and great practice for throwing bigger. My new goal is to center and throw a 25 pounds vessel which is I think the max my rk2 is rated for. 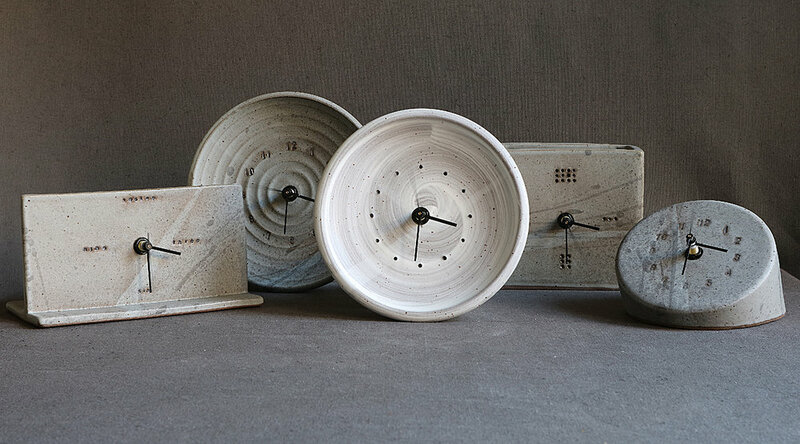 I probably won't be able to fire a piece that big without modifying my kiln, but I guess it's a personal challenge. Anyhow, with all of this brand new clay in my hands I need to get busy throwing some real stuff too. Bowls, bowls, bowls. 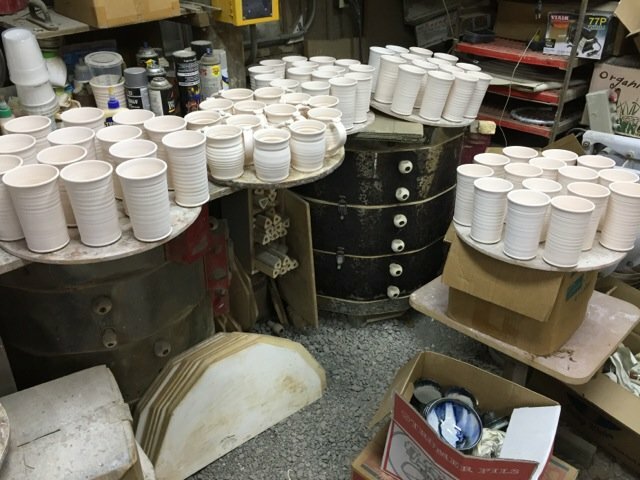 I throw a bunch of bowls and size them in groups by measure after bisqued-thats whats going on with these piles of bowls-they where just sized with a ruler. 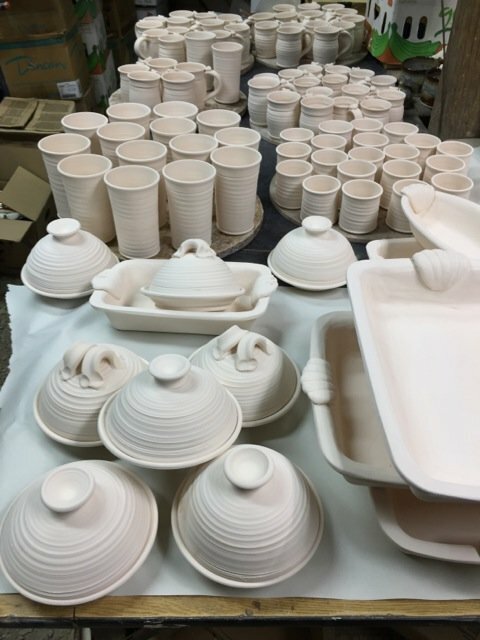 We(my studio assistant and myself) waxed and glazed and I loaded two kilns today-all this bisque ware processed today. 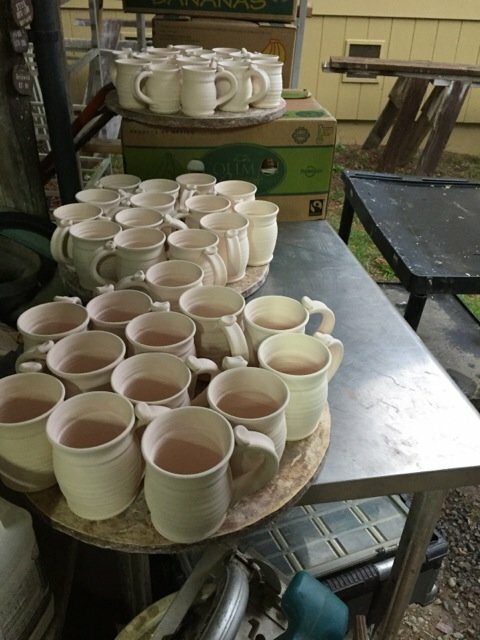 Glaze fires in am. Edited December 11, 2018 by Mark C.
So today started like many glaze days except this was the last one this year. 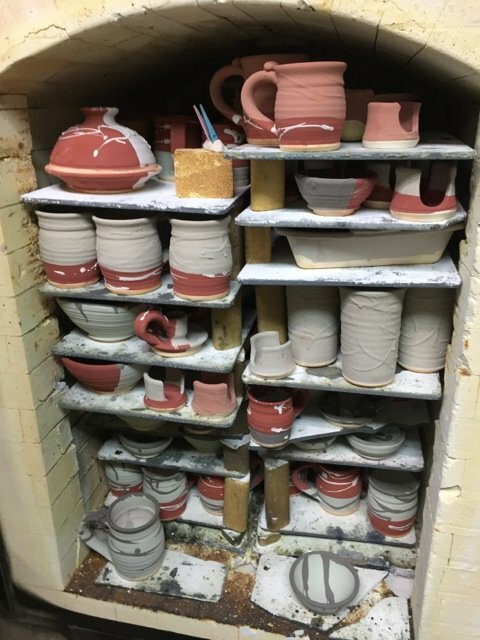 The day ended looking like these last two photos.Which is all that bisque ware you see in above post which got glazed and loaded today. The big car kiln was not quite full (last fire of year is a cleanup of whats left) and the little 12 cubic updraft was bait loose as well. This year in firing making terns is ending earlier than it ever has for me. Due to my two month broken arm setback-I ended up with a whole shows extra inventory-Hence no need to make that much more for xmas.I;ll post a year end comparison as usual for my business later in month after things slow down. 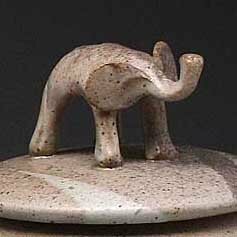 I closed my retail pottery sale booth for two days (mon_tues) to concentrate on the glazing and firing as well as the usually 18 days this season is just a bit to long for me-I like 15 days selling maximum . So is will reopen on Wednesday and sell everyday thru xmas eve. 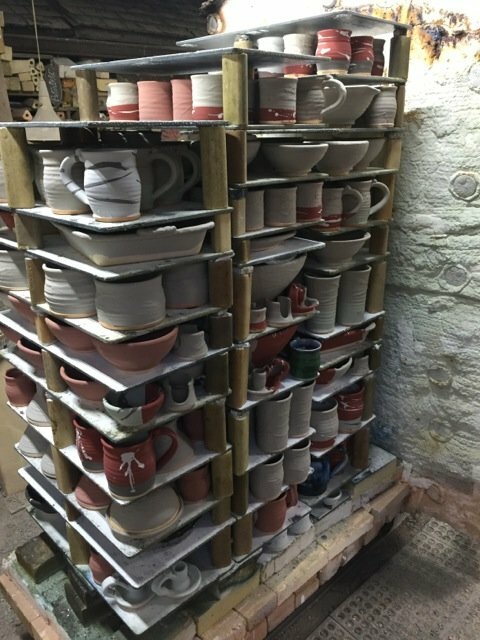 My workbench will be empty of greenware and bisque ware its only for fired pots that need pricing or sorting or shipping now as the selling season is on and the makings season is over. Edited December 18, 2018 by Mark C.
Whew! I'm just exhausted looking at it! Pres its like this every other week on Glaze day and sometimes every week if I took a few weeks and just threw without firing. Its my last fire of this year, only thing left is sell the pots myself and take them to my outlets every week. It go time in my business until the 25th then its as Mea says time to put my feet up -right now I'm waiting for a cortisone shot in my thumb.Seems all this clay work can mess with your body -who knew as one person said recently?